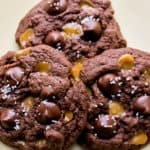 Homemade Gluten Free Salted Caramel Chocolate Chip Cookies have sweet chocolate chips and chewy salted caramel in every bite! These cookies are chewy in the center with crispy edges and so good, no one will be able to tell they are gluten free! This recipe for Gluten Free Salted Caramel Cookies is the first variation that I made using my basic Gluten Free Chocolate Cookies recipe. And, it just so happens to be my favorite, although they are all pretty amazing! In the base recipe, I had mentioned that while creating a few varieties of dark chocolate cookies that were not gluten free, I felt a little bad that my gluten free fiancé couldn’t enjoy them with us. I decided to attempt to recreate that recipe into a gluten free version for him. It turned out that we all love them! 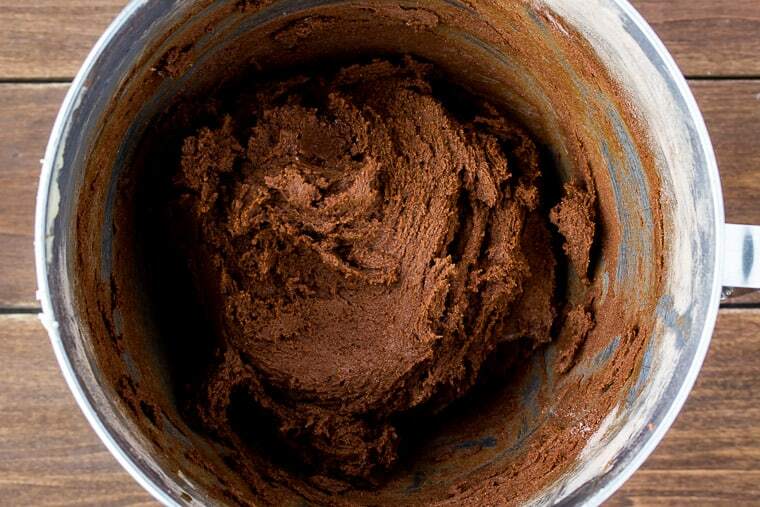 The only differences between this recipe and the base recipe for the dark chocolate cookies is that I use a gluten free all purpose flour (see the recipe notes for more information on what brands work best) and regular unsweetened cocoa rather than dark. The flavor combination of sweet chocolate and chewy salted caramel is just too delicious not to try! 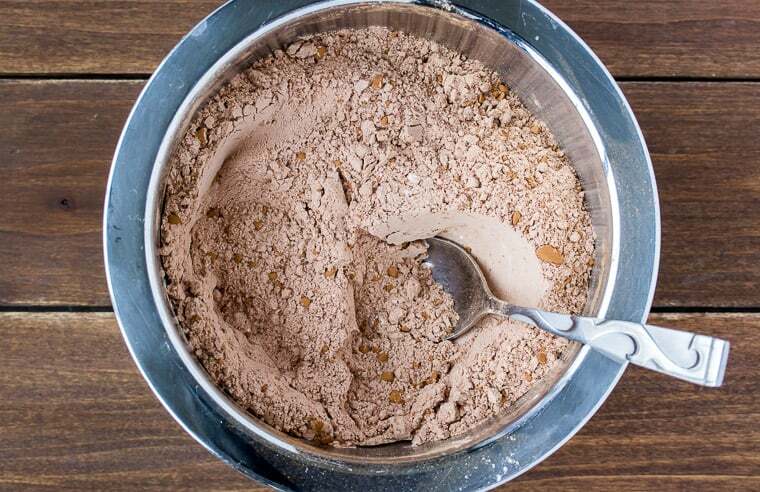 Gradually add the flour mixture to the wet ingredients and mix until well combined. Stir in the chocolate chips and caramel pieces. 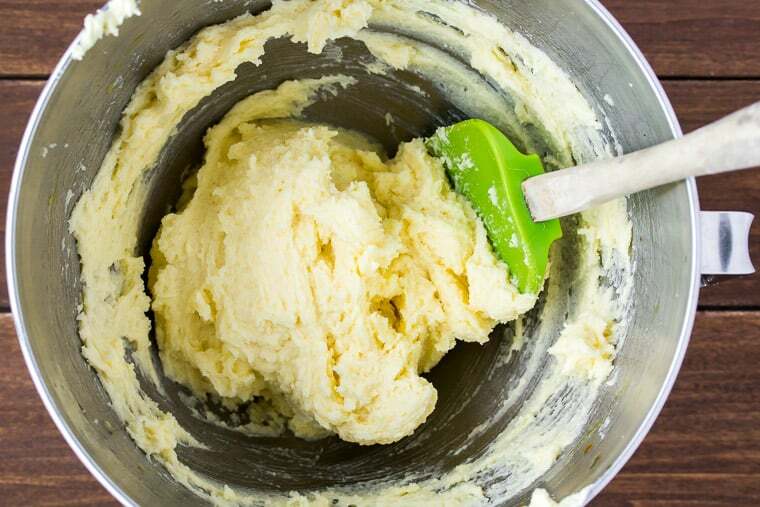 Tip: to get cookies that look like the ones in the photos, leave some of the mix-ins to the side, then press them on top of the dough balls before putting them in the oven. 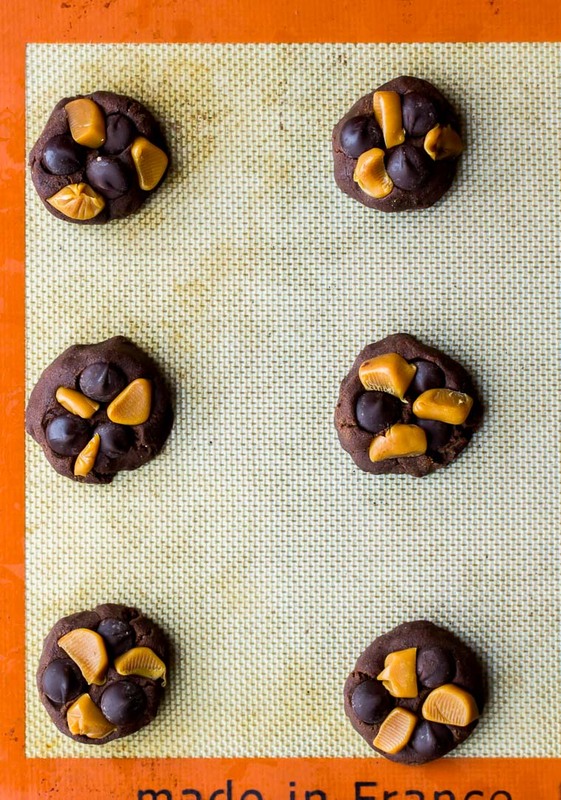 Tip: using a Silpat mat like the one pictured above not only helps keep cookies from sticking, but came in especially handy with this recipe because the melted caramel came right off as well! Sprinkle on the salt the salt, then allow to cool on the baking sheet for about 5 minutes before transferring to a cooling rack to prevent breakage. Using a Silpat mat helps keep the cookies from sticking to the baking sheet, but also made it easy to remove any melted caramel as well. The best caramel for this recipe is Kraft traditional caramels cut into smaller pieces (not the bits – they don’t melt). I have tried Werther’s soft caramels and even though they tasted really good, they melted way too much. 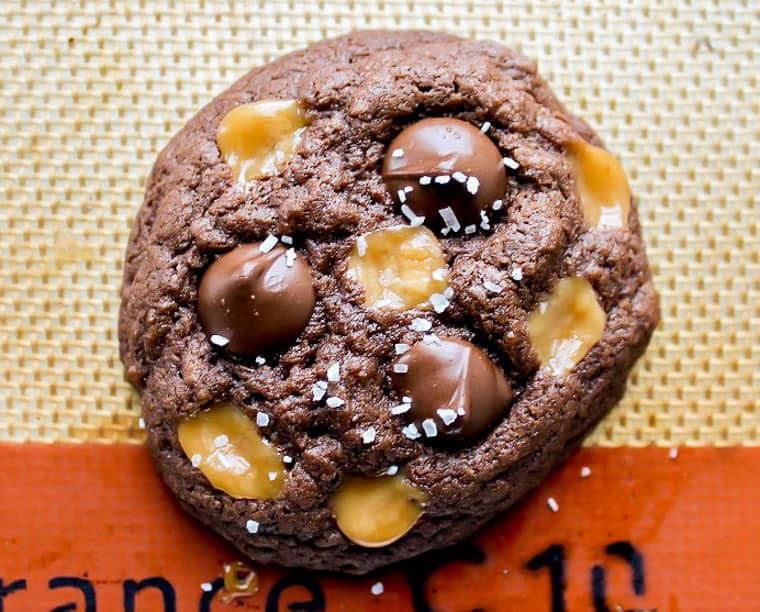 Love this Gluten Free Salted Caramel Chocolate Chip Cookies recipe? Follow me on Pinterest, Instagram, and Facebook for more! 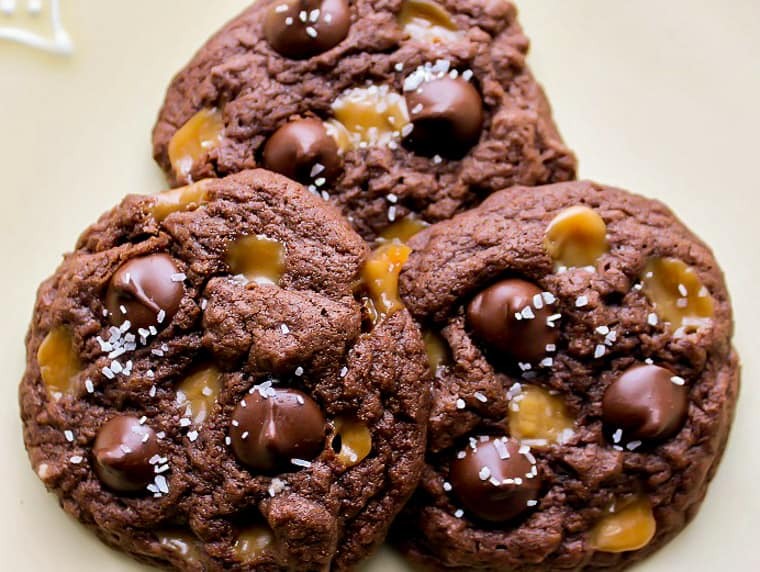 These homemade Gluten Free Salted Caramel Chocolate Chip Cookies have sweet chocolate chips and chewy, salted caramel in every bite! Stir in the chocolate chips and salted caramel pieces. Remove from the oven and sprinkle on the salt. The best caramel for this recipe is Kraft traditional caramels cut into smaller pieces (not the bits - they don't melt). I have tried Werther's soft caramels and even though they tasted really good, they melted way too much. This recipe was originally published on May 24, 2016. It was updated with new images and text in February 2019. Hello. Do how much kosher salt did you use? Also, did you use salted or unsalted butter for these? Thx. Oops sorry – just a tiny pinch per cookie. And unsalted butter – I’ll fix that – thanks! How much kosher salt did you use? I don’t really measure it. I just use a tiny pinch per cookie. Hi Jim. It is 1 and 1/4 cups. 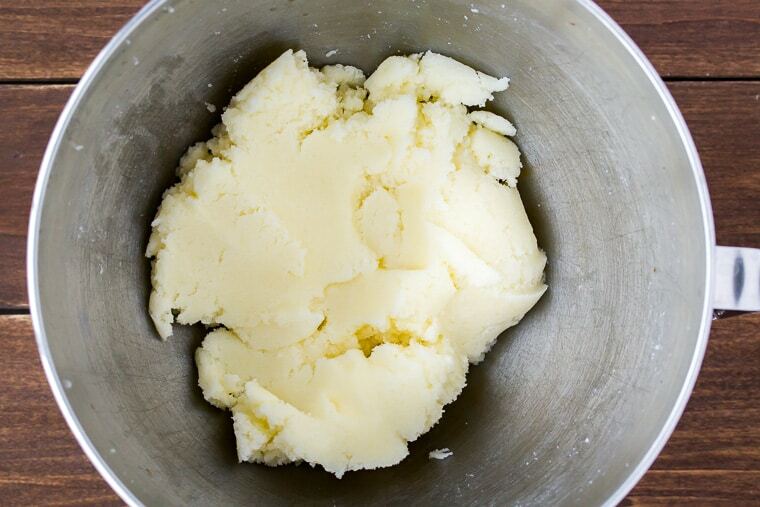 However if the butter is too cold or too warm that may have affected the final results. Baking is so finicky. I’m actually retesting this recipe next week and will alter the recipe, if needed. The feedback I’ve gotten from this recipe, and a few others that use the same base, have not had this issue. So sorry! Salted caramel and chocolate is a match made in heaven. And I absolutely love that these cookies are gluten free! This is a great idea, even for picky eaters! It is really impressive. Looks very tasty. Yum. Thank you. My sister is also on a GF diet so I will be sending her this link! I’m sure she will love these cookies! Lauren, you had me at salted caramel, and I’m loving all the chocolate in these beauties! Looks like I need to try AP GF flour sometime too. Just pinned! How did you get your chips and caramel on top of your cookies exposed like that to have it look so pretty? Not mix them into the batter like your directions? Also what caramel did you use? Does it turn hard after baking (melting) then cooling? Or is it chewy? Hi Jamie! In the post between the last two photos, I explain that to get the cookies to look like the ones in the photos, I leave a little bit of the mix-ins aside and press them on top right before baking them 🙂 I usually use Kraft caramels and cut them into small pieces. They stay chewy after baking. I’m going to be trying prepackaged caramel bits in an upcoming recipe soon, but don’t know yet if they would work as good. Hope this helps – Lauren. Thanks for your response! I know you posted this one a bit ago. Sorry, I saw that you stated how to have the same end result after I posted the comment. Really appreciate know what caramel you used. I used ‘caramel flavored chips’ and I think using what you used might taste a bit better. This looks so good! Will have to try your recipe soon 😀 Thank you for posting this. These look absolutely delicious! I will have to try them out because I am always looking for easy gluten free desserts for my mother-in-law who is Celiac! Thanks for the inspiration and recipe! Awesome! I hope they work out and everyone enjoys them when you make them! I LOVE this combo! Dark chocolate PLUS salted caramel? I cannot imagine how good these are; need to try! Addictingly good! I didn’t use dark chocolate in the cookies pictured but have done it before as well and used it in the non-gluten free version 🙂 I think I like dark chocolate more than regular now! I love recipes that are easily converted to GF. I have several friends who are GF and it’s nice to not have to worry about several different flours! Yes, the blends do make things so much easier! I’ve made cupcakes using a variety of flours and they were awesome, but now I had to buy 3 different flours and it gets expensive. omg! Did you make this recipe JUST for me?! What an awesome recipe for fall, TOTALLY gonna try this! These look perfect – like from a cookbook perfect haha! I also have to follow a gluten free diet and my husband is a huge sweets junkie, so I’m always trying new GF recipes to let us both enjoy yummy things. This clearly was a Must-Pin. Thanks for sharing! Pinned! Those look SO good! YUM!!! Salted caramel and chocolate! Woo-hoo! Thanks for sharing! omg, these look SO good! always on the look out for good GF recipes! Those look INCREDIBLE. Salted carmel is my favorite!!! These look delicious. I’ve never been one for gluten free, but I definitely want to have one of these! Pinned to my “cookies” board. I have been craving cookies lately. Must get my son to help with a batch. Thanks for the recipe! Aww how nice to have a helper…mine starts to help then disappears until they are ready to eat! These do not look like a gluten free cookie at all, they look incredible. Thank You Tamara! I was really happy with how they came out – and surprised too! These look so amazing! I need to try more GF baking. These look SO yummy! I’ve never met a cookie I didn’t like ???? Haha! Hope you like these too! These look so decadent. These would be a huge hit in our home! I will have to try these soon! Thanks for sharing. Yummm!! I have to try these. So many of my family members can’t have gluten so these will be perfect. My GF boyfriend loved them! Hope your family does too! I want caramel in every bite, but not too much, so I thought I’d chop it up and it worked out great! I haven’t really explored a lot of gluten free recipes, but these look amazing! I would definitely give these a try. These cookies look great! I cook a lot of GF for all my GF friends, so I will have to try this recipe! Thank you for sharing! you’re welcome! Hope everyone likes them! You have just made my mouth water! I love everything about this. I am such a salted caramel chocolate girl. It doesn’t matter what it is I love it. These look fabulous by the way!! Thanks Christine! You def need a sweet tooth for these! SALTED CARAMEL EVERYTHING. Omg. This looks SO good. AND it’s gluten free… I’m in heaven. My son sure liked them! Hope your kids do too!